Can VA Buyers Really Buy a Home for Just One Dollar? Yes, you CAN buy a home for a dollar! Thanks to the Liz Moore & Associates $1 VA Move In program, qualified VA buyers in Hampton Roads, Virginia can make their homeownership dreams come true with no money down! Here is how it works: Participating Liz Moore listings with sales prices up to the VA loan limit of $417,000 have partnered with 5 of our preferred lenders and Lytle Title to pay all of the buyer’s closing costs and prepaid items, including a survey and owner’s title insurance. What does that mean for VA eligible buyers? That you can put just one dollar down as an earnest money deposit, and move in after closing with no more money out of pocket! For example, you can buy a $300,000 home with 0 down will have a monthly house payment of $1333 (principal and interest only), for a 30 year loan with a fixed interest rate of 3.25% (APR 3.434%). Hurry – rates may change! In this example, the seller will pay $6,700 of costs on your behalf, enabling you to move in for a dollar. Relocating to Fort Eustis or Langley AFB, VA? We have a military team who is specially trained to serve your needs as a relocating military family. 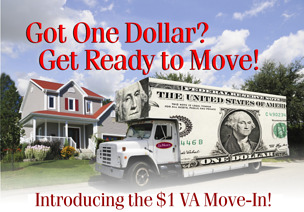 Our VA $1 Move In program is just one of the many benefits available to our military clients who are in PCS mode to the Historic Triangle of Virginia. How do you learn more about the program, see if you qualify, and check out which listings are participating in the campaign? Just visit www.OneDollarVAMoveIn.com, click below, or call a Liz Moore office at 757.873.2707 (Peninsula) or 757.645.4106 (Williamsburg) for details!